It was one of the most unrecognizable pieces of debris I’d ever seen. From broken toilet seats to bottle cap fragments I’ve seen some pretty degraded pieces of trash in the Pacific, but this layered mat of plant fiber, plastic and foam didn’t resemble anything I recognized. A woven layer of rush—a waterside plant with stem-like leaves—was topped with a mint green chunk of foam. 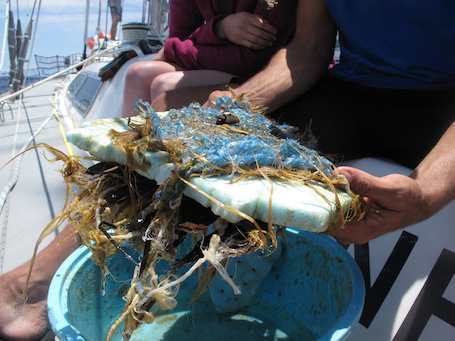 The foam was covered by another piece of woven rush and held together by a layer of thin blue plastic, no thicker than a grocery bag. Marcus sent an email to his Japanese contacts asking about the chunk of debris. Within two days, he received an email from Kana Jones of Dance for Oceans saying it’s a type of Japanese flooring called a tatami mat. Traditional tatami mats have compressed straw inside but modern mats have polyethelene foam sandwiched between woven rush sheets. It was unbelievable to look at this frayed piece of fiber and plastic and realize that it was once inside someone’s home before it was ripped away by the tsunami. It’s thoughts like these that make me uneasy. I wonder if we’re upending historical fragments that were never meant to be recovered. Most of the tsunami debris in the Pacific will remain untouched since it’s sitting at the bottom of the ocean. But floating debris will be treated as a spectacle for years before the last trickle washes ashore. Even now, sitting on deck, watching plastic fragments float by the ship, I wonder where they’ll end up and who will find them. We’ve collected so much debris that it’s piling up on the back of the ship. Buoys and rope and drift net are squashed between plastic buckets and crates and large unidentifiable fragments covered with barnacles and algae. Marcus is looking forward to combing beaches that are littered with plastic when we arrive in Maui. It’s hard to find a place that isn’t touched by pollution, that isn’t littered with trash. In the 20 days we’ve been at sea we’ve yet to find a place that is nothing but wind and ocean waves.